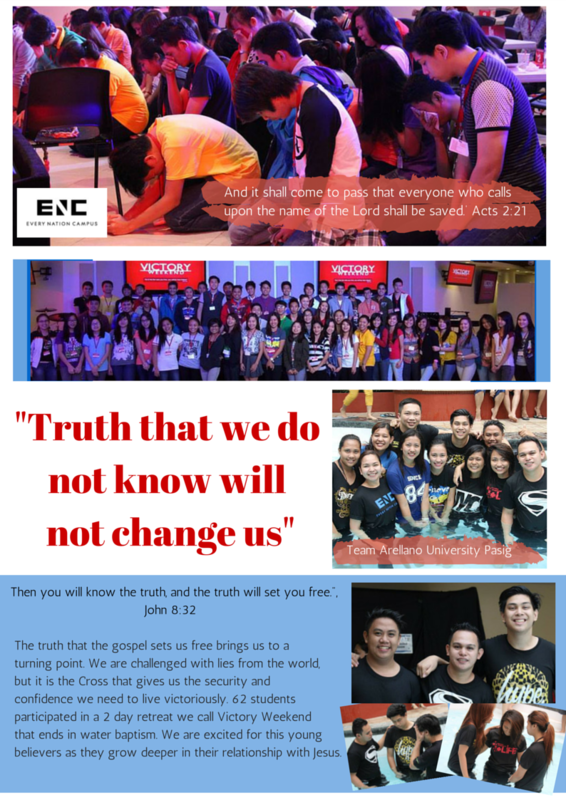 Every Nation Campus Philippines held an event called ONE Conference last July 30, 2016 at PhilSports Area. 5,500 student leaders representing various campuses in Metro Manila participated. Why ONE Conference? We are one team, one campus ministry, under one Lord and Savior, Jesus Christ. And together we are one in bringing the gospel in the campuses and communities. Here is a short recap video of ONE Conference. No new strategy in reaching the campus, just the old boring stroke that perfectly work in reaching the campus and raising leaders. Week in and out we meet together to be discipled and to disciple for Christ. Sharing the gospel and leading students to bible study. As the students grew in relationship with the Lord, they themselves take the lead in reaching their fellow students. Leading fellow student in One 2 one discipleship to discipleship groups. Leaders Huddle about the discipleship groups and topics.